Do you like my version of a baby gate? Naomi always goes into the living room and tries to play the guitar or gets into the wine corks so I decided that since we haven't found a wide enough gate yet that I would make my own. It worked! She cannot get through. Sometimes she crawls under the one leg and gets stuck in between the legs but eventually she remembers how to get back out. 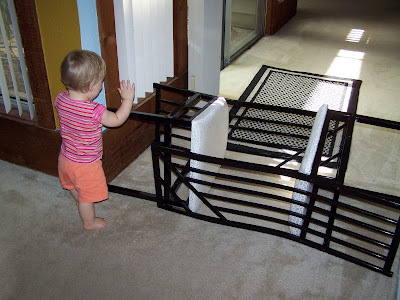 I never realized how expensive baby gates are and there are so many options! So we're looking for a good gate for us and in the mean time this will have to do!